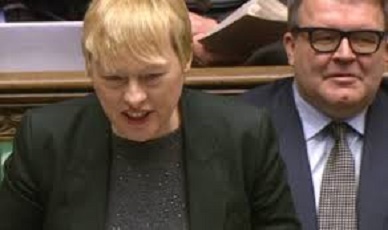 Angela Eagle’s leadership campaign for the top job in the Labour party is to be sponsored by coffee giant Starbucks, according to a statement released today, heralding a partnership that is thought to be completely impartial, aside from some very important messages. Though the leadership bid has been announced today, it will officially begin tomorrow to coincide with a board meeting of Starbucks executives who will be back from week-ends away in country retreats and will want to be present at the inception of this exiting new venture. “I’d like to make the official announcement whilst brandishing a take-away cup of coffee situated at the front of every picture, as per contracted product placement.” Mrs Eagle explained. “I have two main objectives. One to bring the Labour party together by disenfranchising all the lefties, and the other to ensure the world knows what a simply wonderful corporation Starbucks coffee is. Some might see their products as a big bubbly cardboard bucket of caffeinated beverage with their name written on it. I see it as so much more than that. It’s a lifestyle. Starbucks are great. And they shouldn’t have to pay any tax. Present Labour leader Jeremy Corbyn has said he is disappointed in the partnership. “I won’t be partaking in any such agreement with any corporations. I simply fill my flask up with home made instant coffee at the start of the day. Mellow birds. I love it. I suggest you buy some too.” He explained.